Smooth and steady was not exactly the story line for stocks in 2018. After a benign 2017 highlighted as the least volatile year (as defined by the number of 1% moves) in more than 18 years, 2018 rolled in and upended the status quo. 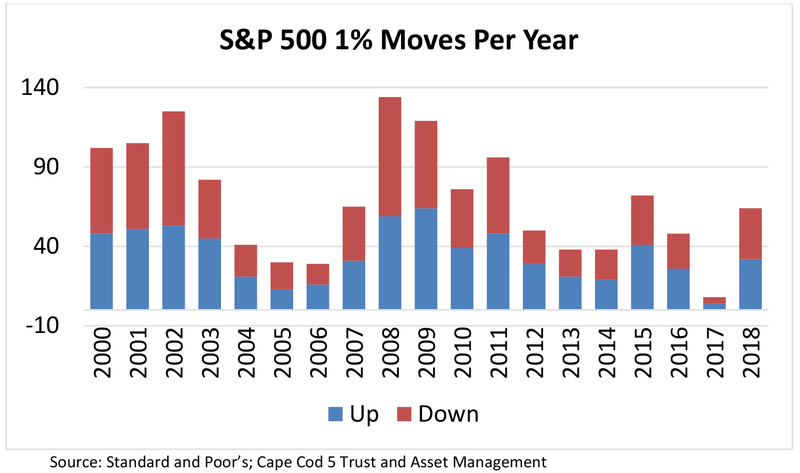 Although the number of 1% moves in 2018 was slightly lower than average, the stark difference in the frequency of these moves in 2018 compared to 2017 surprised many (see chart below). After a strong start to 2018, investors backed away from equities, unnerved by interest rate hikes, trade war rhetoric, and concerns over slowing global economic growth. It took until late August for the S&P 500 to close above January’s high of 2873. The new market high was short lived as the long-running bull market retreated in the fourth quarter. The S&P 500 ended the year at 2507. The three major U.S. stock indices ended the year negative for the first time since 2008. Adding to investor discomfort, yields on the benchmark 10-year U.S. Treasury note reached their highest one-year increase since 2013, driving bond prices lower (bond prices are inversely related to yields). The economic outlook in 4Q18 was muted with early growth estimates sliding from 3% to 2.4%. While fears over a recession in 2019 appear premature, some data points, such as a flattening yield curve, a weakening housing market, and reduced consumer confidence, suggest slowing economic growth ahead. Investors have been closely monitoring the gap between short-term and long-term Treasury yields. This spread conveys sentiment about economic conditions. Inverted yield curves, where short-term rates exceed long-term rates, have historically preceded every recession going back to 1975. In the past five recessions, there has been an average of nineteen months from yield curve inversion to the start of a recession. The spread on two-year Treasury bonds versus ten-year Treasury bonds did not invert during the quarter, but spreads did contract to less than 0.1% in December before ending the year around 0.19%. As interest rates climb, so do mortgage rates, reducing affordability. In 2018 this effect was a primary cause, along with limited inventory, for the largest annual decline in sales of previously owned homes since 2014. October data reported sales fell 5.1% compared to the prior year. Corporate profits are the engine that drive markets higher. The possibility of an earnings recession, defined as two straight quarters of declining S&P 500 earnings, has some investors concerned. While estimates for S&P 500 earnings in 2019 have declined over the past few months (analyst’s reduced October estimates of 10% growth down to 7.9% in December), analysts still expect mid to high single digit earnings growth for 2019, which should be considered quite positive considering the exceptional earnings delivered in 2018. A much-hoped for Santa Claus rally eventually materialized the day after Christmas with the Dow closing 1,086 points higher. Unfortunately, the rest of December felt like the market got run over by a reindeer (maybe a herd of reindeer). Despite achieving 9% growth in the first three quarters of 2018, the S&P 500 surrendered those gains and ended the year down -4.4%. The Dow fell -3.5%, and the NASDAQ lost -2.8%. In the fourth quarter, the S&P 500 fell -13.5%, the Dow lost -11.3%, and the NASDAQ declined -17.3%. The Energy sector was the worst performer in 2018. Shares of energy companies were battered as crude-oil prices fell 23% in 2018. Early October saw a rally to a near four-year high, above $75 a barrel, before increases in supply, waivers on Iran sanctions, and slowing global growth drove down prices. U.S. crude futures settled below $50 by mid-December. Trade-sensitive manufacturers underperformed as the U.S. and China sparred over trade policy. While both countries reached a temporary truce at the G20 summit, the agreement remains tenuous. Deteriorating trade relations could slow corporate earnings growth. Technology shares, one of the best performing sectors over the last few years, stumbled in the second half of 2018 as lofty valuations retreated to more reasonable levels. Of note, Apple and Amazon became the first publicly traded U.S. companies to reach $1 trillion in market capitalization in 2018 before selling off with the sector. As a defensive sector, healthcare stocks were more resilient to market turbulence. The sector was the best performer in 2018. Please see the chart below for complete sector results. The yield on the benchmark 10-year Treasury note, which serves as a reference rate for setting borrowing costs for companies and individuals, rose at the start of the year on the back of rising stocks and a weakening dollar. The yield has since retreated from highs reached in November, dipping back below 3% as stock volatility and worries that Fed policy was hindering economic growth created demand pushing prices up and yields down. The yield ended the year at 2.69%, off the high for the year, yet roughly 11.20% higher than where it ended 2017. Economists expect the economy to grow at a slower rate in 2019 as the benefits from last year’s tax cuts subside and financial conditions tighten. Fed officials have shown confidence in the health of the economy, but many market participants worry that rising interest rates continue to pose a risk. The Fed predicted raising rates twice next year during their December meeting, revising previous expectations for three hikes during their September meeting. Fed officials set their inflation forecast for 2019 at 1.9%, just shy of a September forecast of 2%. If inflation tracks below the Fed’s target, as it has in most years since 2012, it could reduce the speed and magnitude of future Fed Fund rate increases – likely viewed as a positive for stocks. Heading into the New Year, corporate profits remain resilient and the U.S. economy continues to expand, albeit at a slower pace. The labor market is robust with the U.S. adding 312,000 jobs in December, far exceeding economist forecasts of 176,000. Current data points like these suggest the current expansion continues for at least the next several quarters and in the process makes history as the longest expansion in modern U.S. times. Best wishes for a happy, healthy and prosperous 2019.